Asbestos is a naturally occurring fibrous, silicate mineral that was widely used in construction materials from the 1950's until the 1990's. Because of it's tensile strength, it's insulating abilities, and it's resistance to fire and chemical erosion, asbestos was a commonly used component in building and construction materials. Asbestos is comprised of varying concentrations of 6 silicate materials, the most popular being chrysolite. Asbestos occurs naturally but can cause serious illness to people who are exposed in high amounts. 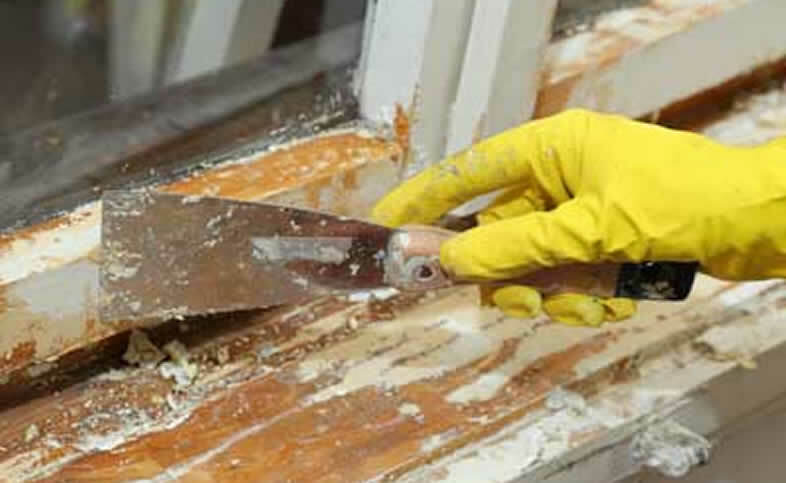 There is little threat of asbestos overexposure when the material is left undisturbed, but when the material is cut, torn or damaged the particles can become airborne. 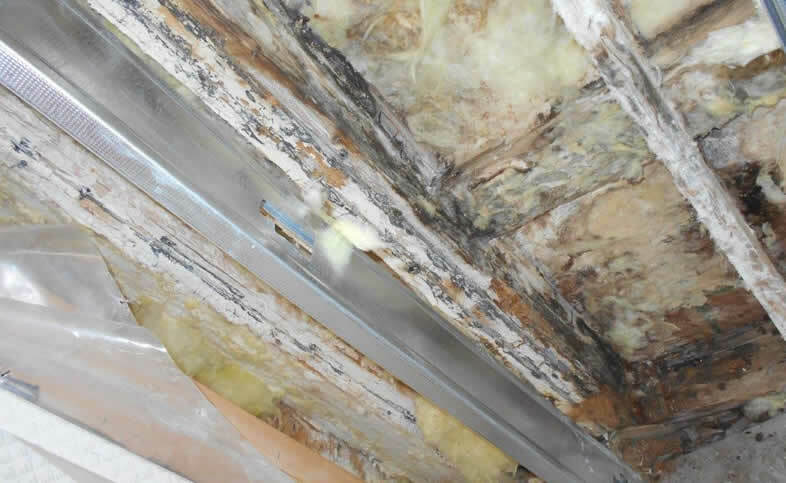 The fibers from asbestos are not visible by the naked eye, therefore it is not possible to determine if an item contains asbestos or not without lab testing. Asbestos is currently not used in items sold in Canada. If your home or business was built prior to 1985 and renovations are to be undertaken then professional testing for asbestos is required. 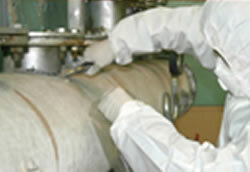 This involves carefully taking a sample of the material, bagging it and taking it to a certified laboratory. People may be exposed to asbestos in their workplace, their communities, or their homes. 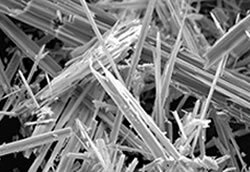 If products containing asbestos are disturbed, tiny asbestos fibers are released into the air. 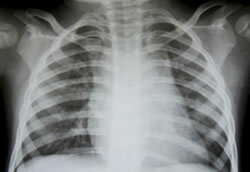 When asbestos fibers are breathed in, they may get trapped in the lungs and remain there for a long time. Over time, these fibers can accumulate and cause scarring and inflammation, which can affect breathing and lead to serious health problems, namely mesothelioma. Lung cancer can be caused by asbestos exposure, and some studies are suggesting there is a link between exposure and other forms of cancer. 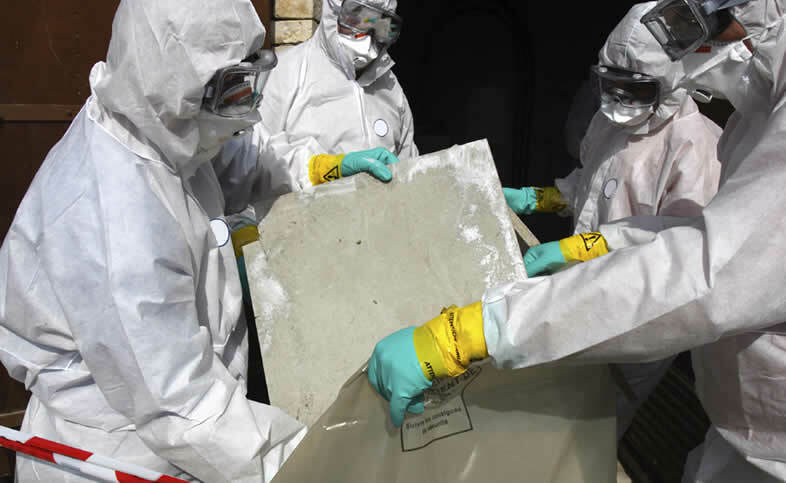 Asbestos abatement removal is a very hazardous job and its removal is strictly governed by the guidelines set out by the Government of Alberta. 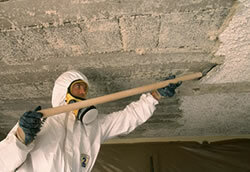 It is recommended that asbestos be removed by a professional asbestos abatement contractor. The contractor will follow protocols set out by the Province of Alberta using the Alberta Asbestos Abatement Manual 2011. Removing the asbestos by a non-professional puts everyone at risk of being exposed to asbestos fibres. Our technicians are Alberta Government certified for asbestos abatement. Vericlean Abatement Group and our knowledgeable technicians are specialized and have extensive experience in small to large asbestos abatement projects including residential to commercial buildings. Always look for professionals with proper training, certification, extensive experience and history of reliability. Vericlean Abatement Group (a division of Vericlean Restoration Services Inc.) is a professional, certified, full service asbestos abatement and mould remediation company using the protocols and guidelines set out by the Alberta Government. 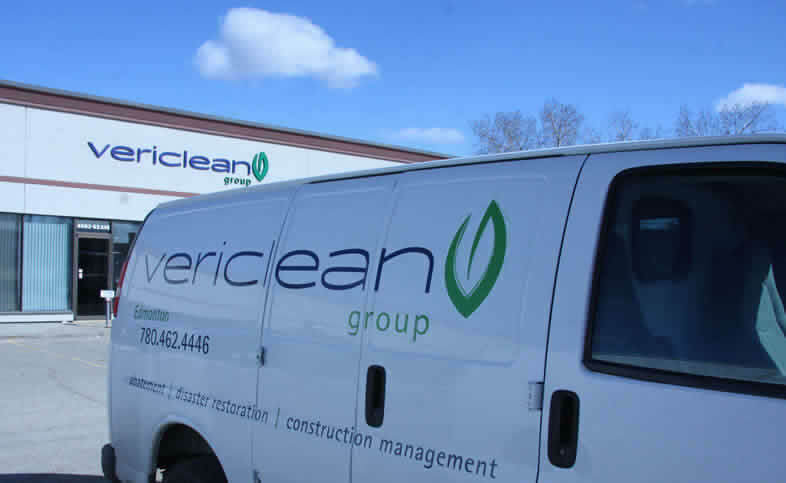 Vericlean services Edmonton and area and northern Alberta. Our knowledgeable technicians are Alberta Government Certified for asbestos removal, and IICRC Certified for mould remediation. Our team is highly specialized and all have extensive experience in small to large asbestos and mould removal projects including residential to commercial buildings. Everything is back to normal, and thanks to Dan and his crew very little patient interruption was created. We did not suffer a loss of revenue. So, I am very thankful for their consideration in the restoration of the clinic. Vericlean was courteous and professional and I'm happy to say I am very satisfied with the work they performed. We had a flood early Sat. morning. Dan & his team were there within the hour! They moved our kitchen island into the living room, cleaned up the soggy, collapsing ceiling in the basement, sucked up the water & dried the carpet. Their professionalism was everything I would hope for but seldom experience. Dan dealt with our insurance adjuster and all of the costs were covered by our insurance. I recommend Vericlean to anyone needing their services. I'm so glad we didn't try to deal with this disaster by ourselves. Thank you Vericlean!